Some big, mean “sports car” debuted Sunday, with 750 horsepower and a large rear wing. We Americans feel obligated to care about that kind of thing, since it has a Chevy badge and eats asphalt for a snack. But we know what you’ve really been looking forward to: the next USPS mail truck. Here’s what may be it. Mail, if we’re honest here, is one of the best times of the day. If you’re home, you get to walk on outside in your flip flops, socks and whatever terrible and old house robe you have, skipping out to the end of the driveway and hoping you may have a greeting card or nice note in your mailbox. Usually it’s just bills, but, you know, whatever. Sometimes mail is good. Anyway, a handful of vehicle builders are up against each other to create the next U.S. 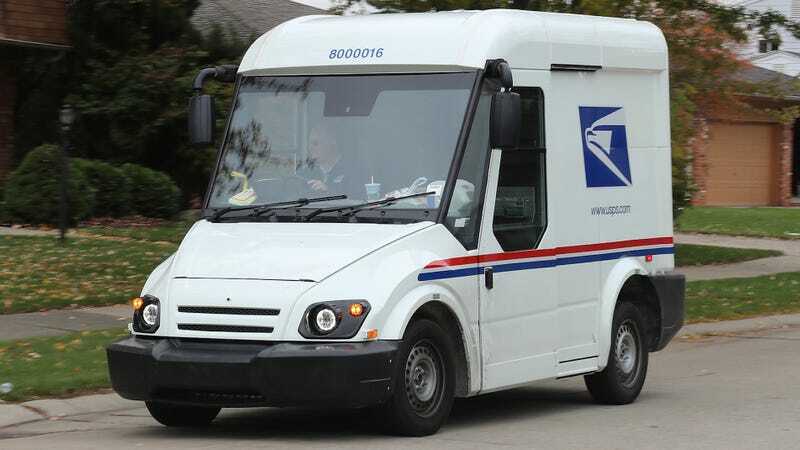 Postal Service mail truck, which needs to be replaced soon since the current one has been delivering mail since the 1980s. This truck is a submission from AM General, a company that builds contract vehicles, for the bid, which AM General told Jalopnik was caught while delivering mail in Sterling Heights, Michigan. Notably taller than the current model, this AM General looks to have the proportions of a Ford Transit Connect. LED lighting in the front and rear replaces the current halogen units. Inside, the steering wheel and TFT instrument cluster seems to be taken from recent Volvo models, but does not suggest any level of autonomous drive. Much of the stalks and switchgear also comes from Volvo, including the Swedish company’s vertically-mounted Sensus touchscreen. For the USPS, it would likely be integrated with shipments and other tracking devices and would cleanly integrate with the service’s networks. An AM General USPS truck would be built in the US, a must for the government bid. It also incorporates a stop-start system with a four-cylinder engine, suggesting more Geely or Volvo cooperation. The USPS is reviewing prototypes and will likely make more decisions on findings early next year.